Nigerian pop star, Runtown is on a roll. With his songs 'Mad Over You' and 'For Life' topping charts all over the continent, the Eric Many frontline act is also raking in awards and signing endorsement deals. 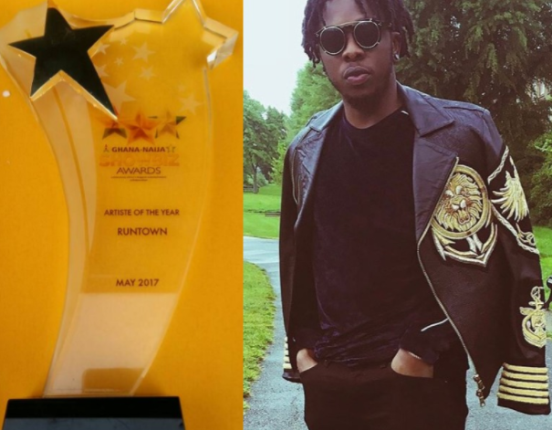 Barely one month after he won the African Artiste of the year at the 2017 Ghana Music Awards that held in April, Runtown is smiling home with yet another huge award. Last night, he bagged the Artiste of the year award at the maiden edition of the Ghana-Naija Showbiz awards that held in Lagos. With the accolades coming in and his songs leading charts, Runtown continues to cement his position as the hottest and biggest pop star on the African continent for the year 2017. He's currently in Nairobi, Kenya on set of the 2017 Coke Studio Africa and will drop the official video for his latest chart topping song 'For life' in a few days.